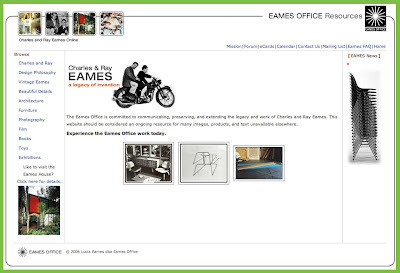 Eames Office website is a useful link for Indian design and designers since it holds the Eames Legacy which has had a major impact on the shaping of modern design education and practice in India over the past 50 years. From the establishment of the National Institute of Design in Ahmedabad through the legendary India Report of 1958 (pdf file 359 kb) drafted by the Charles and Ray Eames at the behest of the first Prime Minister of India, Jawaharlal Nehru, to the setting up of the permanent Nehru Exhibits first at New Delhi’s Pragati Maidan and then at Mumbai’s Nehru Centre at Worli in 1998 gave NID and its designers a direct access to the insights of that Eamses had gleaned in their prolific explorations into many dimensions of design. We will soon embark on the celebration of 50 years of Indian Design and this will be in part a celebration of the contribution of the Eamses as well as the dedication and sustained efforts of the pioneers of Indian design from the National Institute of Design in Ahmedabad. Further the philosophic insights captured in the classic diagram of the design process which can be seen here has been a source of inspiration for all those who have had contact with his work. 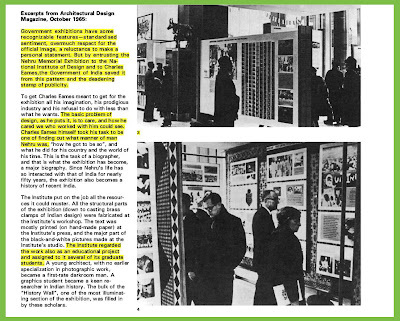 My own contact with the Eames philosophy gave me a new world view and later their practical tips on design action which focused on the minutest details in a “nothing-matters-more-than-the-details” point of view came from my association as a team member on the Nehru Exhibition on a number of occasions. As a student of Furniture Design at NID in the Post Graduate Programme that was started in 1969 we already had a head start into the Eames philosophy since we had access to a number of Eames designed furniture originals in our prototype collection which had been gifted by the Museum of Modern Art, New York after the collection of great designs had traveled in India before finding a permanent place at NID, Ahmedabad. Analysing the Eames collection and watching the collection of Eames films from the NID library were a great source of inspiration for many generations of NID students and faculty as well as for me as well. While this was the source of inspiration for me from 1969 to 1972 as a student at NID I got to experience another dimension of the Eames legacy in November 1972 when I had the opportunity to work as a member of the team on the Nehru Exhibition that was being set up in New Delhi in a new building that was being specially designed to house the exhibit permanently. I got to know the exhibits of the Nehru exhibition like the back of my hand having spent many nights hanging around the exhibition team in the photography department, the letter press studio and the wood workshop where the various parts of the exhibit were being assembled at the NID campus in Paldi. My task was to help design an auditorium with informal seating for a proposed theatre at the exhibition that would show films about Nehru and in another room create a audio-review system that could be used to listen to the many speeches by Nehru while standing next to a set of panels that had some contextual information about each speech. While these were my specific tasks, I had hung around all the other work groups long enough to be aware of the details of all these exhibits as well in a deeply interested and informed manner, which was encouraged in those heady days of "learning by doing" at NID of the 70's and 80's. The Eames treatment of all the elements of the exhibit that was being re-interpreted by Vikas Satwalekar as the then project head was a wholesome learning experience for me. During this same period I was involved with Dashrat Patel and Sen Kapadia in another project being executed at the Pragati Maidan which was also to open in November 1972, the Our India Pavilion where my specific task was to design the ventilation system and the large circular ports that were stuck outside the building, a concept that was a visual feature of Sen’s architecture for the stark building that still stands today as Hall No 15 in the Exhibition grounds at New Delhi. These two experiences brought me professionally closer to both Vikas and Dashrat. They had both worked with Eames in 1964 and they headed the respective projects at New Delhi. When the team for the Chile leg of the Nehru Exhibition was being decided through an emergency call from the Ministry of External Affairs in Delhi, I was selected to travel with Dashrat and B V Mistry to Santiago as a team member and a “crisis manager” to help set up the Nehru Exhibit in Santiago that was scheduled to open on the 26th of January 1973. Our team departed hurriedly on the 14th January 1973 along with 100 kg of excess baggage with photo prints, odds and ends, textiles and nails and adhesive, all that would be needed to set up the Nehru Exhibit in Santiago. Our task was to take the version of the exhibition that had arrived in Chile from Australia and make it ship-shape and presentable in an appropriate layout in the National Museum at Santiago. These experiences gave me a deep insight into the Eames sense of fine detailing and of their ability to handle both communication as well as material structures in one smoothly blended offering. The backs of panels were draped in fine Indian textiles as were the side structures on which the knock-down panels with large photographic exhibits were supported. The structure itself was made stable using textile pouches that could be filled with sand locally so that a heavy base was not required to be transported across the world as the Nehru Exhibit was designed to travel to New York and later to many destinations across the globe. The system for typography and the method of building a history wall were some of the lasting contributions that many generations of NID exhibition and graphic designers perfected while working on the Nehru Exhibition with the Eames’s and their trusted colleagues who came to NID for the first such experience in the mid 60’s. Later the Eames History wall held sway on many NID exhibitions and the hierarchy of typography and the photo style and organization all had the Eames branding strongly embedded in the numerous outings and offerings from NID, be it the Agri-Expo in 1979, the Energy Exhibit in 1983 or the My Land My People in 1994, all mega exhibits handled by the NID teams following the Eames traditions. Quality was in high demand. Sensitivity was demanded from every team member and everyone contributed to the “menial tasks” of cutting and pasting hundreds of photographs and thousands of captions and labels, without a blemish, and here the learning about the finer aspects of design sensitivity were transferred from faculty to student and from carpenter to apprentice. The right-angle was the king, and the plumb-line informed the eye to see the vertical in all its perfection, the results were judged by the same standards that Eames had used for the first exhibition and the traditions of perfection were driven deep into the Indian design community at NID. The re-making of the Eames History Wall was an excellent introduction to information design and expressive visualization. The other dimension of the Eames contribution was the India Report itself which can be downloaded from this link here. The Lota and the message about the Indian craft and culture of innovation and how it would need to be nurtured in a rapidly changing world order were all but lost to the Indian administration who did not seem to understand the role and purpose of design or NID. However having set up the NID and let it operate away from the harsh glare of daily politics in far away Ahmedabad, Indian Design could grow quietly, mature and take roots and build a whole generation of young practitioners who are the cream of Indian design profession and academia today in almost all fields of design education and action. The Eames contribution continued with their continuing interest in the Institute that they helped create in India and Charles visited NID in 1978, a few months before he passed away, and so did Ray, who came to NID to give away the Eames Award to Kamla Devi Chattopadhya in 1988, again a few months before she too passed away on the very same day and date as Charles, 21 August 1988, exactly 10 years apart. While this is a very personal tribute to the Eames legacy in India there are many of my colleagues who have worked directly with Eames as well as in their office in Los Angles at different times of their association with NID and through the amazing process of osmosis that happens when you are in their presence a great deal of learning about design has got transferred to Indian designers which will be mapped and evaluated in the years to come, I hope. 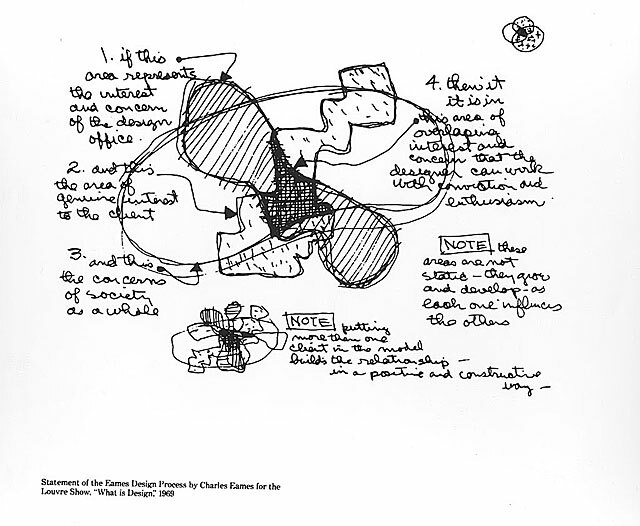 The often repeated Eames quote at NID was – “do not say I will design a chair, rather say I will design something to sit on” – and the idea of broadening ones perception and including an open interpretation of the subject and the context were messages from the Eames that reverberated at NID and informed the education culture at the Institute over the years. 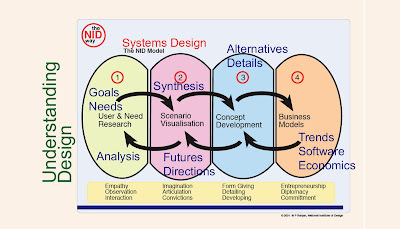 The classic diagram that Charles offered when asked about the nature of the design process is another fine example of insight that has shaped the NID way in shaping the individual and their character through the value systems that were cherished in the NID’s education culture through the 70’s through the 90’s. My most recent contact with the Eames legacy was when their grandson Eames Demetrios visited NID along with representatives of the Herman Miller group to reestablish contact with NID and to distribute his book “An Eames Primer” which I have a signed copy on my bookshelf. Soon after this I got online and obtained for myself a full set of Eames films being offered as a DVD set of six in a box at a very affordable price, much recommended for every design student and school as a source of inspiration and sensitization to be a thinking acting designer with feeling, which for me is the key message from the Eamses, Charles and Ray, thank you. The Eames connection continues to this day since one of my students, Sagarika Sundaram visited the Eames House this year and brought back the pictures that I use here and I am sure the Eames inspiration will mobilise many generations of young designers to come and the Eames Office on the web will be a much sought after destination for design students in their wanderings across the vast contours of the internet. NID too has now opened another chapter of the Eames Award and Fellowship set to begin this year which can be seen at this link here. The NextD Leadership Institute, New York: Can its message offer a direction for design thinking in India? NextD Leadership Institute and the lessons for India? Design is changing and there is one organization that has perhaps contributed most in the past few years in mapping this change and in building tools to cope with the change that they call Design 1.0, Design 2.0 and now Design 3.0. 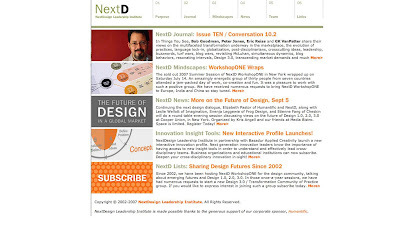 This is the NextD Leadership Institute in New York and through the NextD Journal as well as the series of NextD Workshops they have been spreading the good word about the considerable change that is being seen by some of us today at the leading edge of design action across the world. Their website, NextD.org and their inspiring online Journal and pdf download (all for free) has been a source of great strength for my students who were often perplexed when confronted by the complexities of their design challenges in India but having a resource that could be easily referred was a boon, the value of which only time will tell. Great resource, and we wish that there were more like this one around. The NextD Leadership Institute was an outcome of some soul searching by GK VanPatter and Elizabeth Pastor as an experiment in innovation acceleration back in 2002. In their process of re-inventing design they set out to try and influence design education as well as how it is practiced as an cross-disciplinary activity to address the complex tasks that needed resolution in our society. With the marketplace having changed dramatically they were looking for directions and approaches to make design relevant at the leading edge of this change and one of their key offerings to explain this change was embodied in "Mindscapes" a series of examples, stories, diagrams and models that helped capture the contours of this changed landscape. Recently, in response to the provocative article by Bruce Nussbaum – Are designers the enemy of design – on his blog at BusinessWeek online, the NetxD team quickly sought views from the design community around the world and from this came the rapidly compiled text titled "Beautiful Diversions" which set off another round of debates about design as it is understood today. For me the small NextD team were able to demonstrate the huge change which in the world of internet enabled communication gave equal reach to both small teams as well as established media moguls like the BusinessWeek and the other corporate giants alike. We are indeed heading towards a world that is shaped by the emergent creative economy of the future. The world is indeed changing and as we have seen the KaosPilots as a very small school with very few students making an indelible mark with their ideology and approach to using design, the NextD Leadership Institute too has made an impact in the design space with their Journal, Mindscapes and Workshops, besides other initiatives that have been offered from time to time over the past few years. That we need to bring the message of the NetxD to India is a foregone conclusion. I have recommended their message to all the students in my classes, to my Institute and colleagues as well as to many corporate and design schools in India and many of them are actively using the NextD offerings having bookmarked their website or having subscribed to the regular journal offering which comes free for all those who are interested. Our efforts to find sponsors to get the NextD team over to India continues and we hope to see them soon in India so that the message that they offer can be used in all the 230 sectors of our economy in mission critical applications that are sadly missing in the design activities of the kind that are needed to bring about real transformation in our society as well as in our business offerings, both of which need design, but both seem to be blissfully unaware of this need, notwithstanding the announcement of the National Design Policy in the beginning of this year, on the 8th of February 2007 to be precise, by the Government of India. Just that day I was in downtown New York in a meeting with G K VanPatter along with my colleague Sudrshan Khanna in order to explore the possibility of some collaborations between our two Institutes. I do hope that we can move this forward quickly and that we can then move on to an application stage in the use of these ideas in transforming design education as well as practice in ways that are needed in India over the next few years. By the way, we were in New York to attend the "Design with India"event on the 5th February 2007 at the Asia Society, New York,which was spearheaded by one of our graduates Uday Dandavate founder of SonicRim, Columbus,Ohio. It is not just I who is excited by the NextD it seems, if we are to assess their impact through the varied partners who have agreed to be interviewed by the NextD team for the NextD Journal using a unique format of conversations rather than bland interviews that are usually used in the traditional media or the other form of sage pronouncements by experts who are given space by the media to expand their ideas about the subject of their expertise. The procession of experts who have contributed to the NextD Journal make a literal who's who of design thinking and they come from many disciplines that have engaged with design and therefore have much to offer by way of insights about design that are unique as well as interesting. I have recommended the NextD Journal to all my students as a catch-up on the latest in design thinking that is both concise as well as insightful, take a look for yourself. We have set up a new blog called "Design Concepts & Concerns" named after the course that I teach at NID, Ahmedabad over the past two decades now. 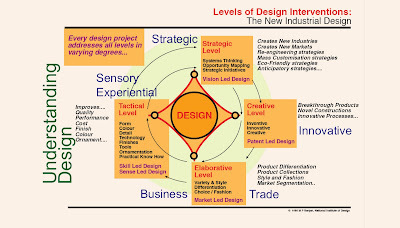 This course was earlier called Design Methods and later Design Process but sometime in 1997-98 I changed the name to "Design Concepts & Concerns" (DCC as the students call it now) since I realised that designing is not just about techniques and about beating the competition with great market success, but that it is about human intentions that lead to thoughts and actions that create value – great value for all stakeholders – if the intentions are clear and these are followed by creative thoughts and committed actions. Setting goals has therefor become a part of this course and it is no longer about taking a client brief and getting on with the job, whatever the job may entail. There is an element of questioning and of taking positions and this makes the act and practice of design quite political and the design students would need to be equipped to assess the varied situations that they would face in the future, in most cases very difficult choices about an unknowable future, no matter how much experience the client or the designer may have had in the past. As part of this course I have set up a multi author blog that includes several teachers who have been working with me as well as colleagues from near and far since they have volunteered to be accessible to students as well as contribute to the explorations taht would be part of each course as we move forward with it this semester at NID. Such an educational blog gives us the opportunity of maintaining a living document of the course as it unfolds each time and this is perhaps close to what Prof Bruce Archer had meant when he told us at NID that we would and should strive to maintain a contemporaneous documentation of design work if we are to build a body of knowledge about design which is otherwise very hard to come by. You may have noticed that designers are notorious for not publishing their insights and processes but most design journalism usually covers the outcomes of a design journey but rarely the process with all its warts and blemishes, which are many, and designers do not want to be seen as making mistakes since most administrators think that making mistakes is a sign of lack of expertise. However we now know that this is far from the truth, and IDEO, one the most successful design companies in recent times has as their slogan – “ to fail often to succeed sooner”, very insightful statement that is central to their design process. This link to the "Design Concepts & Concerns" blog will take you there and show you the assignments and the details of the course as it unfolds this semester at NID. I am offering this course to many disciplines at NID this semester and the current course is at Gandhinagar campus for the Digital Design relaterd disciplines at the new campus that include New Media (NMD), Software and User Interface Design (SUID) and Information and Digital Design (IDD). This is a course of two weeks each and the next modules are offered at the Paldi campus (twice) and also at the Bangalore campus in October 2007 for the new discipline of Design for Retail Experience (DRE) that has started there from June this year. This course has been documented, at least partly, at my website and two modules conducted in 2003 and 2004 can be seen at these links below. Each year we choose a theme for all the modules that are offered to the students and this year the theme is "The Design Opportunities for the Creative Economy in India" and in the course at Gandhinagar we are focussing on Digital Design Opportunities for design entrepreneurs in India across the 230 sectors of our economy. More about the ongoing course and its contemporaneous documentation at the link to the blog "Design Concepts & Concerns"
Most people think the technology shapes our environment and objects in our lives, but few people in India would consider the possibility of this being far from the truth. While technology is indeed one of the drivers of giving shape to the objects in our lives, a far more potent force is culture that in most mature societies deeply influences how our objects and environments are shaped. The use of design in the production of meaning and in our constant striving to transcend the technology that we use to create these in the first place determines many qualities that we cherish as part of culture. The evidence of form giving seen in tribal societies and in the highly evolved and stable village forms that dot our landscape in India show us this deep influence of design and culture in the shaping of our lives and experiences and we can foresee that as our digital technologies develop and mature we will be increasingly using culture through the medium of design as a determinant of the form of our software and hardware interfaces just as we have been using it to shape our living spaces and artifacts that we have been using in our lives. We will therefore need to return to our roots and discover afresh the age old local solutions and in this process try to understand design at a new level of maturity. Design has been a core driver for the shaping of culture and we will need to redefine its role in then shaping our future and in forming and providing meaning to our future selves. In India are fortunate to have a living culture that has a continuity in its settlements and life processes going back over 5000 years of civilization and the manifestations of this long journey are visible all around the country, if we care to take a look. This is a very different kind of design activity that we are talking about here and not the type promoted by the glitterati and the design-as-adjective-media, all dealing with “designer labels”, a creation of marketing strategists in search of gullible consumers. Today, the Economic Times in Ahmedabad had a front page story on Design with a capital “D”, of course, and with a lot of name dropping, well known brand names of cars, perfumes, clothes and lifestyle products, and that in my opinion is another kind of design, the kind that can only lead to global warming by fuelling the consumption culture, and certainly not what I am trying to advocate here. We need to understand design as it was always understood by the common man, a core human activity of thinking and doing, a process of inquiry in a search for insights that could help make an existing situation better in the future for ourselves and for the world. Design at this level is about sensitive and ethical human intentions shaped by thoughts and actions that are steeped with feeling in a process that can generate value for all stakeholders. At this level it is a driver of culture that is sustainable and beneficial to humans as well as the ecology of the planet. India and the Indian village has been the subject of design study in the search of the discovery of the roots of the synthesis of form. Why the Indian village? Christopher Alexander in his masterful thesis called “Notes on the Synthesis of Form” used the generalized Indian village as his object of investigation using as many as 144 parameters that have helped organically shape the relationships that go to make up the structure and form of the typical Indian village. The Indian village was chosen since it is perhaps the only surviving form of settlement that has endured the 5000 year long evolutionary process in arriving at a mature and sustainable model for human settlements and which continues to stand as a living organic system today. This is a model which has been fortunately insulated from mass destruction and migratory pressures and stand as living evidence of forms that can represent the synthesis of forces that give shape to human intentions and designs. While flying from my base in Ahmedabad to Delhi and onwards to Guwahati I can see below the dots that are the villages of the great Gangetic plains below that Alexander studied in 1961, still living and being shaped by many of the forces that he helped describe in his analysis in search for a synthesis of form. The typical Indian village, is a living testimony of sustainability having survived 5000 years, even as we look at it through the haze of poverty and the coloured perceptions that our modern education has endowed on us. Urbanization is not the only option forward since we can innovate other options, only if we try. Looking down at our village from the air and now by doing the same using Google Earth, we can all participate in the live analysis if we can see the forces acting on the ground as did Alexander in the course of his field study in the early sixties. He identified many forces, some technological no doubt but many are attitudes and belief systems as well as rules and laws that have a far greater influence on the shaping of the village than mere technology and the economic parameters that we hold in such high esteem when we consider the modern day artifacts and environments that are being rapidly thrown up by the technological society that we have built in the recent past. We are now using an evolved definition of design which places it on a level that is at the very core of human explorations and innovation over the years. Design is about the insightful and sensitive use of human intentions through our opportunity seeking thoughts and actions to produce meaning and value for ourselves and for society as a whole. In this form it is a very potent force that helps shape culture and it is achieved through our manipulations of materials and in giving shape to our intentions at both the material and at the immaterial and intangible level of systems, services and spaces as well as our artifacts and our interfaces with technology products in the software and artifact space. Design can bridge cultures with its core ability for the sensitive creation of value from channeling human intentions through informed thoughts and actions. Design helps a society connect all of human knowledge with its deeper sensibilities and aspirations and it was an integral part of social and economic action till recent times when it got divorced from daily life in the process of industrialization and mass production. Access to new technologies and the democratization of global communication promises to give new meaning to creative expressions in a two way process that we are now attempting to build into our efforts to use design and its related initiative. Download the paper: Levels of Design Intervention - 200 kb pdf. 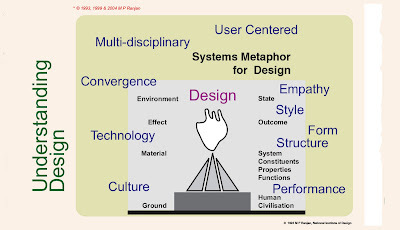 Design is a powerful integrator at the systems level while it may continue to be operative at multiple levels and work across multiple sectors, materials and fields of business and social life. Our conviction about its effectiveness stems from the experience of numerous development projects that we have had in India over the past fifty years of using design as a critical tool for economic and social development. Other countries too are veering towards this new view of design as a vehicle for culture and it is here that we are likely to see its true value for human development. Design as a core human activity evolved from its first appearance over two million years ago when per-humans used fire to ward off predators and provide a sense of security to the early users. From the use of fire to the use of materials and tools is a long journey that chronicles that evolution of design and separates it from the organized forms of both science and art, since it predates both these disciplines when seen at this very general level of engagement with human aspirations and actions. This very integral set of capabilities that were part of rural habitats got separated and differentiated into specialist activities both with the birth of formal education and the university systems as well as through the processes of industrialization and it is now seen as a profession in the periphery of business and social action. Now we have embarked on a journey that goes well beyond material and tools and it includes the creative shaping of ideas about society, politics and ethics just as we looked at function, form and aesthetics and in this new journey we see interesting possibilities for design to expand and embrace this expanding universe of action with growing influence in shaping all our lives. We will need to build new models to understand this evolving profession and build both processes and platforms for education in order to embed these new capabilities in a more formal manner into the shaping of our culture in the days ahead. Some of these approaches are part of our experiments in teaching design to students at the schools in India where design has been largely neglected by both Government and industry for the past fifty years since independence. However the recent surge of interest due to globalization should not limit the scope of its application to just business and industry but make it accessible in its significant role as the core capability in shaping our culture in a rapidly changing world order. Agriculture gave way to Industry and now we are heading towards a new wave of global change that is predicted to transform the way we choose to live and work in the information empowered world order. The dawning of the creative has been predicted by many and countries and cities are vying for creative talent in trying to make their policies more attractive for those with creative energy and this includes many kinds of design professionals and innovative occupations. Does this mean that all such change will take place in urban India and leave the great village devoid of any talent? I do not think so and nor do many of my colleagues in the design profession in India who have been experimenting and researching the great Indian village traditions in search for ways to take these durable traditions forward into the next epoch of change with sustainability. We only need to look at the numerous stories of small-scale entrepreneurship and the vast range of craft, performance and artistic skills that live in our villages today and juxtapose it with the potential that the information age provides all of us to have a two-way communication across the global village to realize that the old bazaar could be recreated anew to offer a platform for a new age economy that can sustain a new economy in new and imaginative ways. 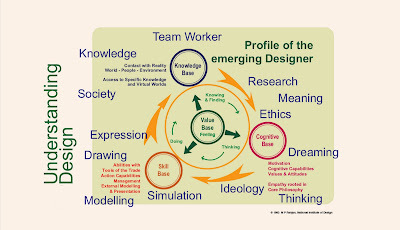 Image 6: Profile of the emerging designer and those who will adopt design as a way forward in their own professions. This is the creative economy and we need to look at design in a fresh perspective not just as a servant of industry and business but as an enabler of such creative enterprises that are driven by local talent and linked to value rich associations with carefully paired relationships that the community channels now provide across the world for those who have similar aspirations and interests. That such networks can be created with the use of local skills and resources can be easily be demonstrated in each sector and some of our young designers are already showing signs of this journey and we will need to harness the pointers that they are revealing to us through their work in the field. Music, art, performance, storytelling through cinema and theatre have all been made accessible to small scale producers, all of whom have the reach across the globe for their offerings. Similarly crafts producers too have the same reach for their wares that are valued for their unique offerings and their exclusive qualities, particularly if they are handmade with a high degree of understanding and empathy for the intended user. Rich texts are being co-produced by collaborators on the net and so is music and image banks and research, all of which point to new possibilities that are emerging that will eventually challenge industry and business in new and exciting ways. India needs to look at this transformation and try and integrate what it has preserved for centuries in the living village economies and then build the creative economy on the back of this great tradition to provide leadership across many spheres of activity in tourism, entertainment and life-styles that are sustainable and satisfying in a modern sense. In order to succeed here we will need to build a policy framework that is sympathetic to the design process of exploration, experimentation, modeling and prototyping before rapid deployment and make the investments in infrastructure and people through appropriate education and an umbrella of supports that would help them realize this potential. This would then be a design led initiative that can usher in the creative economy and other countries too are looking at this possibility but India has a real advantage with a huge cultural resource that is alive and ready to be used. I will elaborate the application of design strategies to other fields in the days ahead and in each one we will need to nurture the creative force of innovation and help make situations and offerings better than they are today. Design can usher in the creative economy and we can make it happen right here in India. The Design Concepts and Concerns course (DCC) had covered this theme earlier in the Foundation as well as in earlier PG batches. This year we are looking at the Creative Economy and its potential for India with the PG batches at Gandhinagar, Paldi as well as Bangalore. I have set up a new blog for the DCC course which can be seen at this link and the theme for this year is the Creative Economy of the Future in the DCC course. The Gandhinagar batch is looking at the design opportunities in the area of Digital Design. Handmade in India, volume 1, is a tribute to the Indian craftsperson and is organized by the geographical distribution of the crafts across all states and regions of the country. 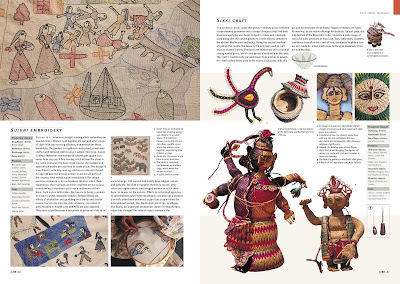 The Indian craftsperson has demonstrated an uncanny understanding of materials which is combined with a mastery of the tools, techniques and processes that have evolved over the centuries through social and cultural interactions, a tribute to the creative design abilities of the village society. The Eames India Report talks about a search for the values that is uniquely Indian and it is here that the study of Indian crafts will help inform current and future actions in the continuous evolution of the economy and the form that it takes in shaping the culture of the land. Today this craft continuum constitutes an enormous resource that can be harnessed for the future development of our society, particularly as the backbone of a creative economy that is enabled by the embedded knowledge in the traditional wisdom of the sector as well as the digital technologies that help connect this ancient skill to new and future opportunities for the craftspersons across India. 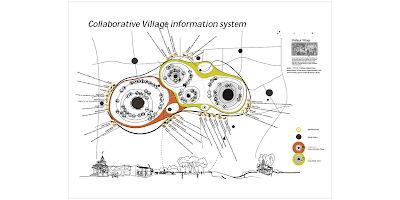 We will need to make this enormous knowledge base accessible to planners, business and the rural and urban craftsmen as well as connect these to new local and global opportunities for these skills and resources to be reinterpreted in new and imaginative ways. This we believe is the foundation of the creative economy of the future in a massively web enabled world and easy access in both directions which promises to link the craftsmen to new markets across the world. For this to happen there are several steps involved and the book will be the first in offering insights and data on this vast resource as well as be a vehicle that can provide a platform and a structure to enhance this knowledge using the new digital networks and tools of access and interaction that it provides provided the required investments are made in infrastructure and training to realize the inherent potential. It is our intention that the information as well as the framework of situated keywords provided in this book will help all concerned with the promotion, development and use of the crafts of India would be empowered to build a sustainable network of live information. This we believe will help our craftsmen re-connect with world markets, just as they had been doing for centuries in their own village and in their trade route networks of the past, and now the world can be their new village economy, if they are enabled and empowered to change to meet these new circumstances with access to information that is both live and relevant. 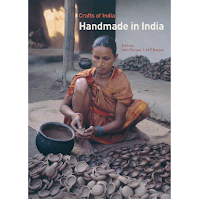 This volume, “Handmade in India”, is the first of three that are planned and it provides a geographic organization of craft distribution across the length and breadth of the country and shows how craft permeates even the remotest corner of India. In this introductory note we have tried to summarize the enormity of craft variety and the significant role that it plays in the day-to-day lives of both rural and urban people. These linked posts below cover several frequently asked questions about this massive work that has gone on for many years at NID and now we are in a position to make it available to a wider audience for the benefit of informed decisions relating to the development initiatives associated with these crafts in India. As editors of this work situated as design teachers at India’s National Institute of Design, we would like to celebrate the arrival of the first advance copy from the Mapin Publishers and it is a confirmation of more that 40 years of efforts by faculty and students of this great Institute who have sustained their interest in the crafts of India as a design and development resource for the country when few other organizations showed real interest in what was seen as a glory of the past. That it is a living resource as well as a resource for the future is something that we would strongly advocate and call for sustained investments from both government and industry to ensure its continuity towards a the realization of its future potential as a driver for the creative economy for the estimated six million crafts persons who have kept this knowledge alive through their actions and traditional methods of transmission which we are today trying to capture in an explicit format between the covers of a book. We have had thinkers from the past comparing the crafts of India with the oceans of the world, vast and impossible to put into a bottle of any kind. We are very aware that it is only the whole earth and its gravity that can act as an adequate container for the oceans and water bodies of our planets ecology. Our vast and varied crafts traditions and practices can be compared to this vast ocean and it is only the tips of this enormous ice-berg that are visible in the book and we hope that the web and the digital networks that built in the subsequently phases can support and can play the role of making the rest of the hidden volume visible and accessible in the days ahead. Our attempt has been to provide a framework on which this can be built in the days ahead. It is a pleasure to hold the advance copy in hand and see the realization of a dream and the fructification of the efforts of several generations of NID designers as well as a large team of contributors who have made this book possible, thank you all. We would like to thank our sponsors the Development Commissioner of Handicrafts, Government of India, the COHANDS, Mapin Publishers as well as our Institute, the National Institute of Design for having provided us the opportunity of producing this work and we look forward to an active period of cooperation in taking this forward to the next stages through volumes two, three and beyond. See a note on the Information Architecture used for the book to enable informed web searches on each craft that is covered here in the book. Dr Alan K Duncan, Medical Director who heads the SPARC innovation Project at the Mayo Clinic, Rochester, Minnesota has this to say about the IDEO team and their design methods: “…..before I began our work with them I only knew of design as a craft of aesthetics. But I found in the designers three remarkable qualities – not too dissimilar to that of the skilled clinician – empathy, curiosity and positivity. I think this is why design can truly find a meaningful home in health care.” Mayo Clinic, one of the worlds largest health care systems looked to innovate ways to make their systems better but found that they were not equipped to do so easily. This innovation effort is supported by the VHA Health Foundation, USA and I do hope that a similar government supported effort can be launched in India as well to use design to address the health care needs here in India. Together with IDEO and an in-house team of doctors and designers the SPARC methodology for health care design was developed and tested. The process that was time tested at IDEO over hundreds of highly successful industry projects (see the amazing IDSA-BusinessWeek design innovation awards statistics) was applied to health care sector by the SPARC team to achieve dramatic results in patient satisfaction and quality of service in a sector that was traditionally handled exclusively by medical staff and administrators. The IDEO way included the use of narratives in seeking opportunities for design action which were rapidly prototyped and evaluated through numerous iterations and the results achieved were then communicated with conviction to the entire medical system using design all the way. The approach included the use of processes and skills that could help design, develop and implement the learning directly into the health care system since the SPARC team was strongly coupled and embedded into the service network as an integral part of it and not operating from the outside. The best traditions of user research have been borrowed by design (see the anthrodesign list on yahoogroups for discussions on this) from the fields of anthropology, psychology and sociology. Using these processes the SPARC team gets into a learning mode by using numerous tools of observation, narration and story telling that helps build a knowledge hierarchy that is both informative as well as sensitive to the deeper needs and feelings of the user groups. The learning curve involves an ask, observe and create cycle that allows one to access tacit knowledge which is not easily accessible to other methods of investigation. Comprehensive records are maintained through the process of interaction and observation with the intent of building models that can be shared and tested through a display of visual information, artifacts and notes. Dealing with health care is a sensitive matter that requires the team to be responsive to issues of access, privacy, care for the human subject as well as the management of the total experience to a high quality of satisfaction. Form of the innovation and the mode of communication that is adopted is the key for the rapid diffusion of the break-through innovations that are achieved through these participatory and embedded processes in the health care innovation system. Using Everett Rogers’ innovation diffusion model the SPARC team looks at the spread of the innovation to explicate the relative advantage to ensure early adoption, compatibility to ensure fit, complexity to make sure that it makes sense, trialibility so that it can be tried and tested repeatedly and finally observability so the innovation can be seen to be believed in, all of which contribute to the smooth adoption of the innovation across a wide base of user groups. Mayo Clinic discovered design in their search for an innovation tool and procedure that could be sustained within their own health care system and starting in 2002 in the planning stage the SPARC effort has reached maturity and full staff operation by 2005, leading to a dramatic transformation from within and the assimilation of the process of design as an integral part of the health care delivery system, which is the best way to use design in any case, from the inside. This is what I call putting design inside the health care system and in India we need to do this in as many as 230 sectors of our economy. I would like to thank my friend Matthew Maleska for bringing this amazing story to my attention. Matt had traveled to India as a Fulbright scholar and studied at NID briefly after graduating from the RISD, Providence. Returning to the USA to join the SPARC team as an in-house design researcher along with a large team of doctors and medical staff at the Mayo Clinic he is finding a meaningful role for himself to use design skills within the health care system. Thank you. This kind of demonstration, if taken seriously by the Government of India and the medical establishment in India and it is adopted here in India as well it could show us the way for putting design inside all 230 other sectors that are in need of innovation today, in an effective manner. Now "Experientia" has a story on SPARC: putting people first.